In Pakistan hanging, stoning and other outlandish sentences such as death by mutilation caused by incisions and acid were the adapted methods of execution which the Pakistan Army and Judiciary used to exercise in open until a moratorium on executions was imposed in 2008. However, the APS tragedy in Peshawar in 2014, which left 140 innocent children dead, re-invoked the reintroduction of this ghastly punishment. 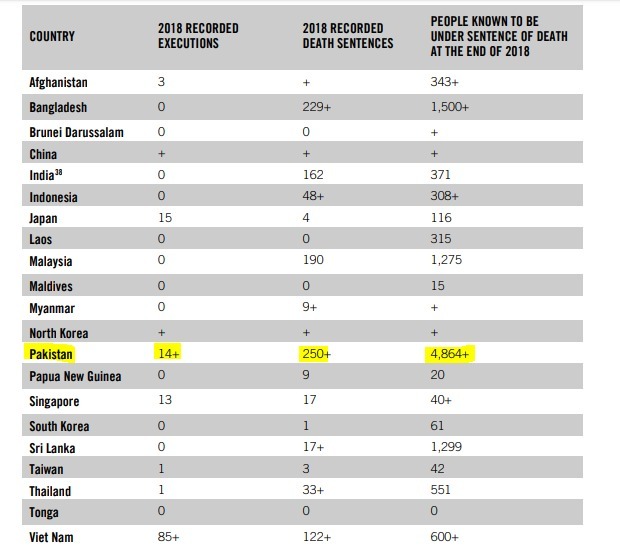 As per defence.pk the country’s annual rate of executions has reached the highest point in its history making it the third most prolific executioner in the world. For a red-faced Pakistan Army and a failed state machinery, this was the laziest, easiest and most inhuman way of a show of power to the guilty and the not guilty. This move was strongly condemned by the United Nations and human rights campaigners who said it would do little to impede the Taliban. And as is seen the rampage of death sentences since 2014 has done nothing to deter the criminals in Pakistan. It is foolish to think that a suicide bomber will be deterred by the death penalty, however, to implicate a defaulter and hang him till death is a cowardly way of dealing with the issue. 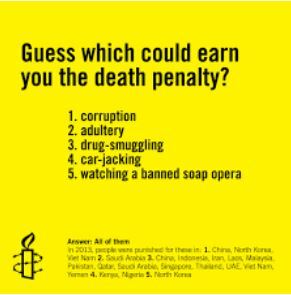 Pakistan’s big brother China and North Korea are believed to be among the world’s top executioners. However, specific figures are difficult to obtain because they are concealed by the authorities. Together, Iran, Saudi Arabia, Iraq, and Pakistan accounted for 87 percent of all recorded worldwide executions. Pakistan COAS signs 15-20 death sentences on a monthly basis. Sometimes the figure touches up to 30 also. Until Dec 2016 he had signed 161 death warrants as per Gulf News, leaving Gen Raheel Sharif far behind. But as per the latest Amnesty report, Pakistan tops the list of countries with people known to be under sentence of death at the end of 2018. Since the lifting of the moratorium, 2000+ executions have been carried outwith the highest number of executions taking place in the province of Punjab. Whilst there is no confirmed figure for Pakistan’s total death row population, reports suggest 20,000 prisoners remain at risk of imminent. Earlier a press release issued by the JPP revealed that in as many as 88 percents of ‘terrorism’ cases, there was no link to a terrorist organization or anything that could be reasonably defined as terrorism. The question is when Pakistan’s Constitution exempts military law and laws for the discipline of police and security forces from constitutional provisions protecting the individual’s right to life how is General Qamar Bajwa on a death sentencing spree. Article 185 specifically addresses appeals to the Supreme Court in cases involving a death sentence. Under Article 227 of the Constitution, Islamic law impacts the rights of Muslims in Pakistan, and under Article 203, the Federal Shari’at Court can determine the applicability of Islamic law in certain death-eligible cases. However, in Pakistan, nothing is above Pakistan Army and the constitution is just a framework to suit their designs and tamper with as when need be. Are these convicts permitted a legal course to prove not guilty? This issue is of grave concern as it denies an individual not guilty of a crime, the right to live. 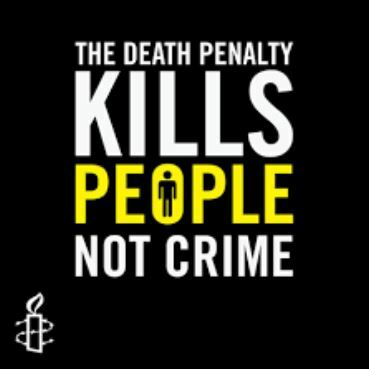 This issue has now caught the attention of HRC and other NGO’s worldwide, highlighting the disproportionate application of the death penalty on a wide array of lesser offenses that do not constitute “the most serious crimes”. When dug deep it is found out that this dramatic rise in sentencing death and executions in Pakistan is a murky racket which is not only unethical but insanely barbaric. Pay bribes and irregular payments in return for favorable judgments is a big corruption racket running in Pakistan. Ask any Pakistani if he/she has faith in their own judicial system you will know for yourself that there is truth in the can of worms unboxed. However, this time it is not just corruption in Pakistan which is worrying, it is the barbarism and inhuman approach towards its own people to fulfill own aspirations; could be political or professional or personal. A callous method adapted to justify to the people of Pakistan by giving them a false sense of security that terrorists are put behind bars. The white-collar assassins are shamelessly pocketing this “blood money” or “haram” of mostly those who were either made scapegoats by the state, falsely accused as terrorists, who were too weak to fight the corrupt system or not allowed legal representation. All is definitely not well in Pakistan. It has ethically collapsed and morally stained by its own rulers, the Pakistan Army, and the puppet state machinery. This betrayal will be hard for the people of Pakistan to digest, but by connecting the dots the true face of Pakistan Army and its corrupt politicians is unmasked. The regular massacres in Baluchistan, the ire of the west~ who have facts to prove Pakistan as a haven of terrorists, the huge debts that have piled up, animosity with neighbors (India, Iran, and Afghanistan). What have the people of Pakistan got in return for trusting their beloved country with such erratic and corrupt leaders?